Q1: How can I get a replacement New Jersey boating safety certificate? A1: The Marine Services Bureau cannot replace Boating Safety Certificates over the phone. All requests for replacement must be E-mailed or sent through the United States Postal Service. NOTE: In the case of a legal name change you must include your full legal name as it appeared on your original certificate as well as your current legal name, proof of name change (marriage certificate, divorce decree etc.). NOTE: In the case of an address change, you must include your address as it appeared on your original certificate as well as your current address. If you are unsure of the exact previous address, list all previous addresses that it could potentially be. NOTE: Attach a photo or scanned copy (must be legible) of your driver’s license, and if your address changed make sure your driver’s license shows your new address, if it doesn’t please attach a photo or photocopy of a utility bill or statement etc. that shows your name with current address. NOTE: Any attached photos or scanned copies of information must be in .jpg /.bmp format or in a Microsoft Word document. Enlarge all images sent as they will not be legible otherwise. Q2: What is a Boat License? A2: It is an endorsement on your New Jersey Driver’s License or ID card that allows you to operate a vessel on non-tidal waters. It is not a replacement for your Boating Safety Certificate, but an additional required document for non-tidal waters. Follow the link below to find out more information about Boat License requirements. Q3: I am visiting New Jersey, do I need a Boat Safety Certificate? A3: To operate a vessel upon the waters of this State, an individual would need one of the following: a Boat Safety Certificate issued in their home State, a New Jersey Boat Safety Certificate, United States Coast Guard Captain’s License, or written proof of completion of a safety course approved by N.A.S.B.L.A. or one substantially similar to a New Jersey Course. Q4: I have taken a boating safety course in the past, how do I get a certificate? A4: Contact the Marine Services Bureau using one of the methods listed in A1 above. Provide as much information about yourself and the class as possible. Q5: My son/daughter took a safety course when there were 12, how can I get their certificate? A5: Contact the Marine Services Bureau using one of the methods listed in A1 above. Provide as much information about your child and the class as possible. Q6: I have a Boat Safety Certificate from another State and I am moving to New Jersey, will New Jersey issue a certificate based on that? A6: No. 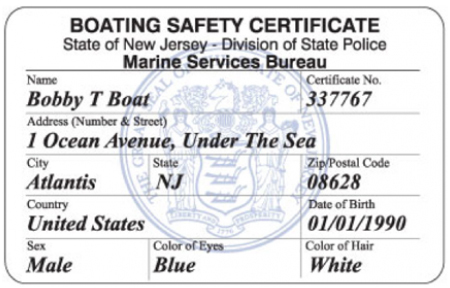 The Marine Services Bureau can only issue New Jersey Boat Safety Certificates for successfully completed approved New Jersey courses. However, some courses taught in Pennsylvania and New York States are approved as New Jersey safety courses. In this case, the instructor of the course will provide you with a New Jersey State Police Application for a Boat Safety Certificate (S.P.421) to serve as your temporary Boat Safety Certificate. The Marine Services Bureau will send the instructor your permanent certificate for issuance to the student. If there is any question if this applies to your course, the matter has to be resolved by the course provider not the Marine Services Bureau. Q7: Where can I take a Boat Safety Course? A7: To find an approved safety course in your area, check newspaper listings, area night schools, marinas, boating supply stores, or search the internet. The New Jersey State Police, Marine Services Bureau does not provide the course at this time. Q8: Can I take the boat safety course on-line? A8: Yes. However, after successful completion of the internet portion of the course, the student will have to complete an in-person, proctored exam. The Marine Services Bureau cautions students, prior to beginning the on-line study, to check with the on-line course provider to insure they provide a testing location within driving distance from the student’s location.